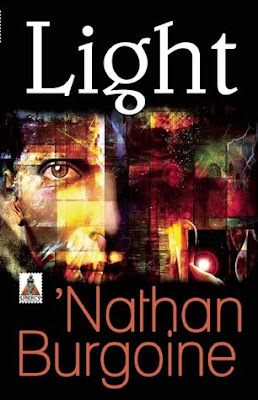 Light is 'Nathan Burgoine's full-length debut novel. I've read most of Burgoine's short stories in different LGBT anthologies, so I'm quite familiar with his writing style. What I have found is that he has a knack for writing tight, complete short stories within the LGBTQ romance, spec-fic and erotica genres and that the gay themes central to his stories, whether YA or adult, are always pertinent to contemporary issues. This is a great combination of talents. In Light, Burgoine utilizes these talents to great effect. Gay massage therapist Kieran Quinn is taking his yearly vacation to enjoy and participate in all the great events going on during Pride Week in his hometown of Ottawa, Canada. Kieran is cute but his love life is not necessarily blooming with life and ends up going to the opening ceremony with a not-so-impressive blind date. Besides being cute, a great therapist, and having a knack for a snappy, dry quip or two, our man possesses what he considers to be a few weak powers of the psychokinetic and telepathic kind, with an ability for refracting light and bending it into rainbows. He has hidden these abilities from others all his life, that is until the homophobic religious zealot Wyatt Jackson, or Stigmatic Jack, misuses similar powers to hurt the crowd during the opening ceremony and Kieran comes forth to defend his community with a burst of light and rainbows. Yes, this is the story of a hero in the making. During the aftermath, Kieran aids wounded leather man hunk Sebastien LaRoche, Pride Week's events organizer, and one of Kieran's fantasies comes to life when a thank you turns to heat between the two men. Unfortunately, Stigmatic Jack is still a danger to the LGBTQ community and Kieran is not about to let him hurt anyone if he can help it. But, can he stop Stigmatic Jack, and how long can Kieran hide his identity? Despite the fact that I'm familiar with Burgoine's writing style, I was still surprised at how well everything just clicked in his debut full-length novel -- possibly because from past experiences I know that not all great short story writers can make a full-length novel sing the first time around. That's not a problem I found here at all! Burgoine utilizes that tight writing style and knack for keeping the reader engaged by incorporating action at just the right moments, making central, secondary, and peripheral characters distinctive and pertinent, and using the very contemporary issue of religious zealotry and homophobia as a central gay theme. The thing is, that all of this is achieved with humor, excellent dialog, and the excitement found in a superhero romantic adventure story. 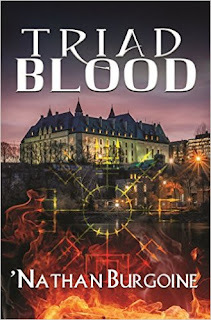 Additionally, and not surprisingly, Burgoine effectively uses sexual tension to build the chemistry and evolving romance that heats up between Kieran and Sebastien without relying on the expected graphic sexual scenes. Kieran is a well constructed character with depth. He's also just fun to know. I believe that what I liked about this character is that although he is portrayed as being an out and proud gay man, there are still things he hides from others about himself, about what he really wants and who he is -- he can still surprise himself and others. "Fabulous, fun, entertaining and absorbing. Read it in one seating. Loved Kieran! Great debut novel." Those impressions are just right. Light by 'Nathan Burgoine not only kept me entertained and absorbed throughout, I finished it with a smile on my face. What fun! Now, I'll just look forward to reading Burgoine's next novel. I agree that Light was a fun and feel good read and a great debut novel - just as Mr. Burgoine's debut short story "Heart" way back. He seems to do debuts very well. I do hope there's a sequel at some point. Indie, I also hope there is a sequel to this book. Kieran and Sebastien are ripe for more adventures. I finally read your review and excellent interview with 'Nathan Burgoine and as a result am carrying Fool for Love with me again, so I can reread his short story "Heart." (Although you know I'll end up rereading all of them, *g*). It's interesting that both his debut short and debut novel have in common the memorable "voice" of his central characters. "Light" is an ingenious work full of humour and suspense that should appeal to any lover of paranormal romances that enjoy heros that aren't all that heroic after all.